Amenities: Use of laundry facilities, kitchen. Shared internet facilities. 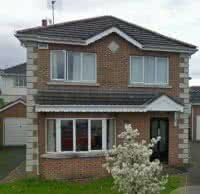 Bright/clean/modern house w/large back garden. Good transport links. Finnegan's feeder bus to Bray dart station. 145 & 45a bus routes near by. Comments: Full or half board. 5/7 days. 2x single rooms 1x double room.